Ok now I know I shouldn't talk about another app on glow but you guys can have two or more! I just wanted to say how helpful Kindara is when watching your BBT. 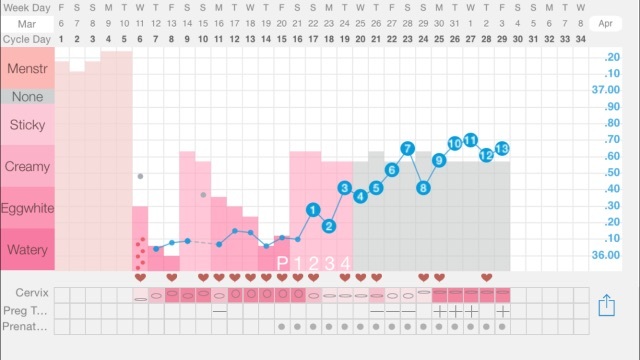 It lays out a chart showing temps and cm and makes it REALLY easy to see when you ovulate (granted you don't really know you ovulated until the day after). I used it for one month and found out 100% when my most fertile days were. Charts are so easy to read! This month (my second month) got my BFP. Thought I would share because I know a lot of people wonder if glow is accurate :) See my chart below!